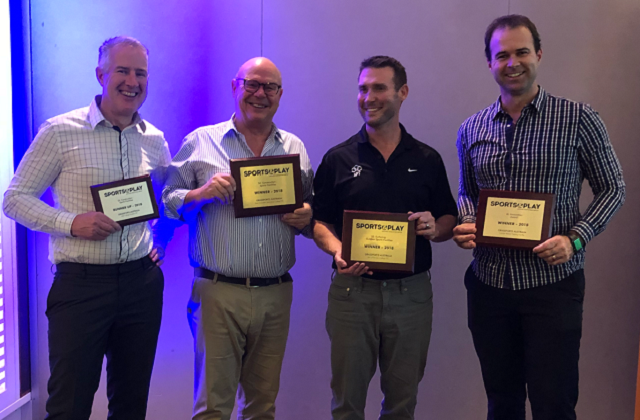 Grassports Australia achieve winning entries at the Sports and Play Industry Association 2018 national conference. Grassports Australia are proud to announce securing three winning entries at the Sports and Play Industry Association (SAPIA) 2018 national conference in August. One of these winning entries was in the Surfacing Outdoor Sports Facilities category and the other was in the category Contruction of Sports Facilities where we were also awarded a runner up. We also achieved the Innovation Award for our Exclusive Cricket Wicket Training Innovation. Grassports Australia would like to thank SAPIA and our industry who have applauded our efforts and expertise and offer our congratulations to the other entrants in the awards. Full construction of facilities at East Doncaster Secondary College comprising a full-sized soccer field, the school multi-purpose facility caters for athletics (including a 100m sprint track and two lane long jump pit), futsal, cricket and other active play. An additional passive area and multi-sports courts resurface have also been completed and our exclusive, award-winning cricket wicket training innovation has been installed to assist coaching. Watch the video and read the full customer story here. Existing maintenance customer, Star of the Sea College has utilised the expertise of Grassports Australia to maintain the performance of their facility of the past 13 years. When it came time to resurface, Grassports Australia were a natural and trusted choice to upgrade the sports courts in order to satisfy the requirements of the school physical education curriculum. Offering a comprehensive design solution, this new multi-sport layout incorporates of basketball, tennis, netball, sprint track and softball diamonds. Read the full customer story here. In the innovation category we were the winning entrant for our Exclusive, award winning cricket wicket training innovation. A professional cricket facility suitable for players of all levels, this training system assists coaching, helps improve player and team performance and is the latest initiative in cricket coaching and player performance. Exclusive and patented, only available at Grassports Australia, it features clearly and permanently marked areas on the pitch and an impressive colourful appearance. These unique features mean that players can see where the ball bounces increasing the accuracy of bowlers more quickly than on a regular pitch. Find out more here and read the Mentone Grammar cricket customer story here. Ilim College, Doveton campus now has a compact, custom designed school sports facility accommodating soccer, basketball, athletics, netball and hockey. A new primary school campus for our existing client had no usable spaces for sport. We provided full construction of their brand-new sports facility from the design phase through to completion. From concrete base through to top quality multipurpose sports surface, fencing, sports hardware and lighting to extend to night time recreational use, our comprehensive design solution and range of surface options resulted in a truly multipurpose facility. Read the full customer story here. Pictured: Bernard Evans, Darren Scanlan, Jim Tritt (APT - one of our product manufacturers) and Brenden Dawson.